The exciting stages are certainly still to come David. The draw is on Monday with some truly mouth-watering ties on the cards. Join us tomorrow as Manchester City aim to secure their place in the last 16. "Arsenal have beaten Galatasaray twice by four goals, who've conceded 16 goals without winning a game. "They've definitely been the poor relations of that group. "Before a ball was kicked, we'd have said Arsenal and Dortmund would go through. There's a bit of glamour gone form the group stage when we have an assumption of who will go through. "Generally speaking, it goes to form and the exciting stages of the Champions League are yet to come." Indeed Niklas. The Swiss league may be under-rated. Every time I've seen Basel (which is admittedly those eight occasions), they look a very decent outfit indeed. "We often talk about why teams aren't pro-active rather than reactive. It's so important to go and get the first goal and put your opposition on the back foot. "It's important to play that opening 20 minutes with tempo. It's something Arsenal have been good at in recent years, but Liverpool didn't deliver that tonight. "Liverpool had to be reactive in the second half as they were so poor in the first." Who's in the last 16? Just two spots available in the last 16 now, with Manchester City hoping to be able to take one of those. Atletico Madrid, Juventus, Real Madrid, Basel, Monaco, Bayer Leverkusen, Borussia Dortmund, Arsenal, Bayern Munich, Paris St-Germain, Barcelona, Chelsea, Porto, Shakhtar Donetsk. Kevin in Hornchurch: Liverpool post Suarez and Spurs post Bale have spent £250 million between them and you couldn't say a combined team would win anything. Simply shocking investment of funds. Modern day football as we know it. Laughable as it is scandalous. 'The fingernail barely touched his nose'. Not a quote you hear from a manager very often, but Liverpool boss Brendan Rodgers is not happy about that red card shown to Lazar Markovic. Charlie Varley: That may well be Steven Gerrard's last ever Champions League match. Is this goodbye to one of Europe's greatest? Arsenal's list of potential opponents reads like a horror film. Both Madrid sides, Barcelona or PSG, Bayern Munich, Monaco and Porto are all on the list. Arsene Wenger on the disappointment of finishing second in the group: "We won four games, lost one and had one draw. Looking back, we can maybe regret that point at home to Anderlecht. Liverpool manager Brendan Rodgers speaking to ITV Sport: "We have to fight going forward to be in this competition next season. We are not too far off the top four and, if we get there, we will be better in it next season. The possibility of January signings is something to discuss with the owners, but there was a big investment in the summer. We have been unlucky with injuries to key players who are important to the way that we play, but that is to take nothing away from the players tonight who have put everything into the game." On Lazar Markovic's sending off:" I thought it was an awful decision, I thought the referee was poor tonight to say the least. Young Markovic has come on and been bright and, although he has put his hand out, it was not a sending off. The referee has seen the lad lying on the floor holding his face, but I don't know if he has seen the actual incident." Rich in Hampshire: Away at Man Utd, a tricky league cup tie at Bournemouth and then home to Arsenal - it's not going to get any easier for Liverpool. Full-times blowing around the grounds and this is who have booked their places in the last 16. In Group A, Atletico Madrid and Juventus are through after sharing a goalless draw in Turin. In Group C, Monaco go through as group winners, despite scoring only scoring four goals across their six games. Half of those came tonight in a 2-0 win over Zenit St Petersburg which leapfrogged them over Bayer Leverkusen in second. It briefly looked as though Arsenal might overhaul Borussia Dortmund at the top of Group D after a early slew of goals against Galatasaray, but the Gunners ran out of steam and now settle for second place on goal difference. Arsene Wenger on Aaron Ramsey's second goal of the night: "When he took the shot I thought that was maybe not the best idea, but the way he took it, it flew in. You need to see Aaron Ramsey's second goal tonight. Wow doesn't cover it. Arsenal manager Arsene Wenger speaking to Sky Sports: "There's a little bit of frustration that we have finished runners-up, but we knew at half time we needed to score six goals without conceding. Read further reaction, match report and your thoughts on the Arsenal game here. Will Liverpool be back in the Champions League next season? They are six points short of the top four as it stands. His players are giving their all, he says. Full reaction to come. We are just waiting for Brendan Rodgers to face the music now. Will he concede that his team selection was not quite right? Should he have had a striker on the bench? Steven Gerrard speaking to ITV Sport: "I still knew after I scored that it was going to be difficult with 10 men and running out of time, but it gave us some hope and, as the manager said, the first half was not good enough and we had to go down fighting. "I have not seen the sending off, but I have heard it was harsh. It made it harder because we could have made it hell for Basel in the final stages with 11 men. "I don't think we deserved better. We have not gone out because of this performance, we weren't good enough away to Basel and we let in a silly goal away to Ludogorets. You qualify over six games and we have not been good enough. "We need to get our main striker Daniel Sturridge back and get some more goals in the side. We need to get Mario Balotelli back and firing. That is not to take away anything from the lads who have played tonight and have slogged their guts out. "Rickie Lambert has ran himself into the ground tonight, but it has just been a game too far tonight and that has been because of a lack of numbers." If you need to respond to criticism after a weekend defeat then registering three goals inside half an hour is probably the way to go about your business. Arsenal were already into the last-16 before tonight's results and though Dortmund's draw with Anderlecht ensures the Gunner finish second in Group D, they can draw confidence from the manner in which they dealt with a trip to Turkey. The draw comes on Monday. Arsenal will hope they are not punished for failing to top the group. Follow all of the reaction to Arsenal's win here. The Basel players are saluted by the roaring away end as Anfield empties out around them. To qualify from this group is a very good effort from the Swiss side. Liverpool captain Steven Gerrard says his side didn't have the legs in the last 15 minutes because of a very harsh red card for Lazar Markovic. He does say though that his side do not deserve to qualify. Premier League sides may be getting plenty more tough groups if they keep this up. The Premier League's coefficient is falling like shares on the Wall Street Crash. "Steven Gerrard tried his best but Liverpool fell way short on the night, with only a late rally with defender Martin Skrtel thrown up front in desperation getting Anfield going. It's Thursday-Sunday-Thursday-Sunday time from now on for Liverpool and their fans then. At least this year the winners of the Europa League are handed a Champions League berth. Will Brendan Rodgers go for it? Did he go for it tonight? Real Madrid are racking up a few extras late on. Alvaro Medran, on in place of Gareth Bale, slots in the defending champions' unanswered fourth against Ludogorets. Over the way, Borussia Dortmund have been pegged back by a Aleksandar Mitrovic goal for Anderlecht, but with Arsenal 'only' beating Galatasaray 4-1 the Germans are still top of the group. 'You'll Never Walk Alone' is sung heartily by some fans on the Kop but that was painful viewing for most of the evening. Liverpool will play in the Europa League. Even worse than going out altogether...? It's finished at one apiece. Liverpool are out. Basel go through. Heads in hands in the stands. Bad touch. Gone. Get it to Raheem Sterling. Give pace a chance. Sterling beats his man, puts it in low and hard - and Martin Skrtel meets it! Wide! Good effort on the stretch but wide. Got to go forward, got to go forward. Poor touch though from Jordan Henderson and Basel counter - the cross comes in and a white shirt is close to reaching it! Basel through - this game has lost its head now - and Breel Embolo is well denied by Simon Mignolet at his near post. Next goal wins now, playground stuff. "Relentless pressure from Liverpool, we're looking at four, maybe five minutes added on." Deflected - Another corner. Away to Steven Gerrard 25 yards out, strikes but over the top. "Liverpool transformed with that goal and a cross from the left, Henderson with the header, it took a deflection and the keeper had to dive suddenly to his right to stop it crossing the line. "Liverpool giving it a real go." Real Madrid will advance to the last 16 with a perfect 18 points. Alvaro Arbeloa just about sweeps the ball over the line to register the defending champions' third against a tiring Ludogorets. Jordan Henderson goes up for a header, it's deflected, wrongfoots the keeper - but just grabbed on the line. Got to go big now. Get it in there! Tom Miszkowski: Liverpool need a big target man to lump the ball up to for the last 10 mins, get Ricky Lambert on. Oh wait a minute.. Chance! Liverpool almost blow it again as Taulant Xhaka gets in behind their defence - but he leans back and slices wide. That was close. Jeremiah Kareuki: The epic, invincible and exceptional Steven Gerrard! He saves the night for the Kops with a screamer of a free kick. Even the most loyal Liverpool fan must agree that sometimes the whole 'Steven Gerrard saviour' act wears a bit thin. But he just delivers so often when he really needs to. It is incredible. Anfield rocking now as the 10 men win a corner, but this one is poor. Liverpool seven minutes away from elimination still. They need one more. "Finally Anfield is alive and there is hope - and no prizes for guessing the man who is threatening to dig Liverpool out of this hole. Steven Gerrard did it 10 years ago against Olympiakos and has given Liverpool a chance of reaching the knockout phase." "Only one person, when Liverpool needed him most - Steven Gerrard delivers in a red shirt. "The 10 men of Liverpool have hope and it was an exquisite free-kick that gave the keeper no chance." Incredible! He just does it time and time again! At the Kop End, his team on its knees, and Steven Gerrard delivers the most brilliant free-kick. Into the top corner, off the inside of the post in fact. It could not be better placed. Olympiakos, who are leading Malmo 2-1, would go through if they hang on and Juve fall behind, but that doesn't look likely so far. Monaco are set to take Group C top spot, after moving 1-0 up on Zenit through Aymen Abdennour's close-range header. Dan in Mansfield: Rodgers has been found out. No crosses coming in when Lambert was playing. Second half, take him off and start crossing. Clueless. Just two shots on target for Liverpool all night - but they do have a free-kick just outside the area. One for Steven Gerrard? Harry Stephenson: Coutinho is on 73 minutes too late. A bit of head-scratching on the BBC Football desk as we try and work out where Philippe Coutinho is playing. The answer is a lot deeper than he should be. Raheem Sterling remains isolated and alone up front as the 10 men try and find a breakthrough. Jake Saunders: Liverpool don't even deserve the Europa League. We're like a sickly old dog that just needs putting down. Ben Oliver: Markovic will also miss LFC's next three Champions League games as well, that's the funny side of it. 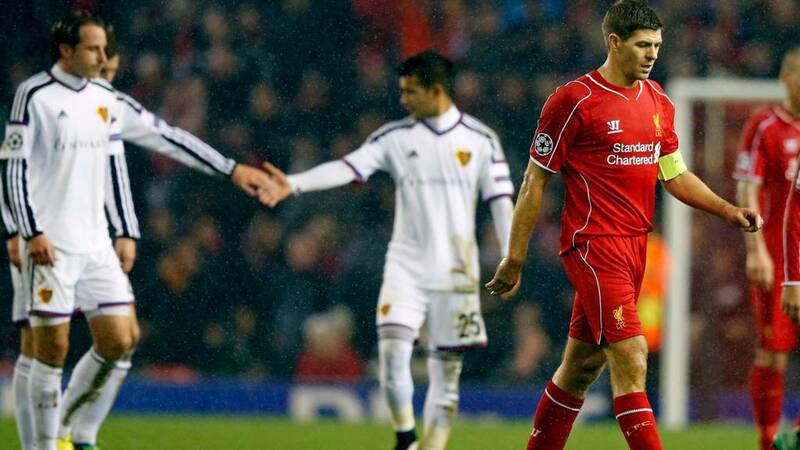 Basel have been as impressive as Liverpool have been underwhelming tonight. The Swiss side look well in control as we approach the last 10 minutes. A draw would still be enough for them to go through. James in Midhurst: Liverpool being found out tonight and this season. Carried by Suarez last season as we all said. Drawing board beckons. Philippe Coutinho is on for Liverpool, holding midfielder Lucas makes way, while Basel hand teenage strike sensation Breel Embolo the last 15 minutes. Ashton Moore: If Liverpool get through to the next round now, I'm calling my first child Brendan. Regardless of gender. Steven Gerrard now pretty much playing up front and he cracks a shot well wide from 25 yards. Hit and hope time. We have just over 15 minutes left though. Plenty of time. In theory, anyway. "The crowd are now further enraged with the referee as Gerrard tried to go around the keeper and was felled. "But, it looked as though he got a touch there ahead of Gerrard despite the Kop's cries for a penalty." Liverpool start to commit men forwards, Steven Gerrard gets through for the first time and goes down! Is that a penalty? Nothing given by referee Bjorn Kuipers, and the replay shows it's a great call. Goalkeeper Tomas Vaclik got to the ball first, pushing it against Gerrard and away. Arsenal fans hoping for a landslide win to overhaul Borussia Dortmund at the top of the Group D can, at least for the moment, put away their calculators. The Germans are back two points clear at the top as it stands thanks to Ciro Immobile, who rattles home a finish from Nuri Sahin's pass. As it stands, Basel will join Real Madrid in the last 16. Liverpool heading into the Europa League. "A tactical change now with three at the back. Moreno has pushed on in to the midfield and Henderson now on the right of midfield." Martin Skrtel gets the ball in space 35 yards from goal, he has little or no options ahead of him so has a swing at it and cracks a drive just wide! Good hit. Shooting from range looks like the only dish on the menu now though. Dejan Lovren is into the book now for a cynical tug on the dynamic Taulant Xhaka. Liverpool have 24 minutes left to save their Champions League campaign. Will in East Dulwich: I hope Rodgers doesn't use that decision as an excuse. Liverpool are poor and his team selection worse still. "Desperate for Liverpool now. Complete over-reaction from Basel's Behrang Safari but what on earth was Lazar Markovic thinking about? Even more frustrating because he had actually shown signs of why Liverpool were tempted to spend £20m on him in the summer." Luke in Portsmouth: Unfortunately, that's the state of European football. They are, and always have been, far more open to gamesmanship - we English refuse to sink to this level, but often it's too our detriment. I'm not sure that's always the case Luke! Cristiano Ronaldo is just two behind Lionel Messi's Champions League goal tally of 74 following his first-half penalty. At home to a Ludogorets side who are down to 10 men, should be a shooting gallery, but so far the Bulgarian side are riding their luck and are just 2-0 down in the Bernabeu. "A controversial sending off. Basically just a swipe of the arm as Lazar Markovic tried to run away from Behrang Safari. "I don't think he touched him with his fingertips, but the referee has deemed it violent conduct and Liverpool have now lost an attacking player while still needing to score twice." Steven Gerrard's name is being sung loudly from the Kop now. More in hope than expectation. Brendan Rodgers cannot believe it, cradling his head in his hands, as substitute Lazar Markovic is shown a straight red card. It's so soft too, Markovic flicking out his arm to fend off Behrang Safari, and the Swedish full-back goes down holding his face. There was minimal contact, but enough for referee Bjorn Kuipers to send the winger off. What else can go wrong tonight for Liverpool? Mark in Cheshire: Are we really playing 4-6-0 now? Needing to score twice? They say there is a fine line between genius and insanity. James in Liverpool: This has the dreaded feeling of Chelsea last year, camped on the edge of the box, cannot score or even create good openings. Unlucky! Brilliant play from Basel right-back Taulant Xhaka, carving through the centre of the pitch, beating two men for pace and then strength before firing in a left-footed daisy cutter. Low and bobbly, it has Simon Mignolet worried all the way and eventually trickles inches wide of the corner. Mo in Manchester: You heard it here first, we'll be 2-0 down by 90 minutes and still be passing across our defence. Lazar Markovic has raised the crowd at least. He is very direct, looking for the run or shot at every turn, cracking in two efforts from 20 yards which are both well blocked. Entering the last half hour. The third act of this night of drama. Time for some late fireworks? Neat play on the edge of the box from Liverpool but again, when Raheem Sterling gets a cross in there is nobody in red inside the penalty box. Too easy to defend against. "They're getting exasperated, the Liverpool supporters as they still need two goals to go through. "They're lacking that composure in possession and now Raheem Sterling is that focal point in attack after Rickie Lambert was substituted. "Basel are still attacking and are very organised. Paulo Sousa is telling his team to get back every time they give the ball away." Lazar Markovic is at least trying out there. Every time he gets the ball he puts his head down and runs for his life, but there is nobody ahead of him and he eventually falls over his own feet. Liverpool look pretty much clueless at the moment. Forget German efficiency, the Monaco model is the minimalist way to make the last 16. The French side have scored just two and conceded only one in their first five Group C games. Their sixth, at home to Zenit St Petersburg, is, perhaps unsurprisingly, 0-0 at half-time. As it stands, Dimitar Berbatov's mob are going through behind Bayer Leverkusen. Alberto Moreno puts in a fine first-time cross, right into the space where a number nine would be standing. Rickie Lambert was replaced at the break however, so the ball bounces harmlessly away for a throw in on the far side. Mark Duffell: An unproven winger and a full back on. One of Lallana and Coutinho to miss out? Was Brendan watching the first half? Jamie Warman: Did Lovren come with a receipt? It's Christmas time. Perhaps there is an extended returns period? James Brandon: Enrique a complete passenger in the first half, not surprised to see him off. Tom Wylie: We need two goals at least so let's bring on a defender and a player who hasn't scored this season! Clueless Rodgers! A reminder of how Liverpool now line up. Looks like Raheem Sterling is playing up front, but there is no out-and-out striker. Switched on? Or stupid? Liverpool XI: Mignolet, Johnson, Moreno, Lovren, Skrtel, Lucas, Allen, Henderson, Gerrard, Sterling, Markovic. Under way at a sodden Anfield. Steven Gerrard has a very early strike, wide from 25 yards. Chasing two goals, Liverpool have taken off their only striker Rickie Lambert. He is replaced by Lazar Markovic, while Alberto Moreno replaces Jose Enrique at left-back. False nine time? No such worries for Arsenal tonight, the Gunners in cruise control after scoring one of the great Champions League goals. David in London: Terrible from Liverpool. Why does Rodgers start with three mainly defensive midfielders, and two defensive, slow full backs? Lallana, Coutinho and the two Spanish full backs should all be playing. Rodgers, I'm afraid I've lost faith in you. Half-time whistles peeping around the continent and it has not been one of the all-time great halves of Champions League football. Seven games have so far produced just seven goals. Arsenal have three of them, leading Galatasaray 3-0. Real Madrid have two of them, leading Ludogorets 2-0. And Basel have one to put them ahead at Anfield. Olympiakos's David Fuster has got the only other one so far to put his side up on Malmo. It will be good enough to earn the Greeks Europa league football, but no more, as it stands. That is because Juventus are holding Atletico Madrid to a 0-0 draw, a scoreline good enough to take the Italians through. Lew Daney: In the second half we attack the Kop end, that should do the trick, right?...... right? QPR goalkeeper Rob Green on Radio 5 live: "It is going to be a big ask now, a massive ask. Basel are no mugs, they've kept it tight at the back and made it really difficult for Liverpool. Whoever comes on for Liverpool is going to find it tough because they need to hit the ground running and make an impact." Kevin Keats in Bradford: Any danger of Liverpool turning up? Can't remember seeing a good first half performance this season. Abject. Jack in Lancashire: Really poor team selection from Rodgers tonight. No creativity and more concerned about not conceding than scoring. Liverpool played 102 more passes than Basel in that first half but you would never have guessed. The Swiss side cutting through at will at times. As it stands, they are heading into the last 16. "A doom-laden Anfield response to the half-time whistle. Liverpool have been dreadful, lacking movement, pace and confidence. There has been a complete absence of creativity so it may not be too long before Phillipe Coutinho and Adam Lallana are introduced. "It will take quite a transformation because Basel have looked more likely to add a second than Liverpool have to equalise." "Liverpool need to find two goals in the second half, but they also need to drastically improve. "After an initial bright start, they've lacked composure and style to their play. "In contrast, Basel going forward have been a real threat and Fabian Frei's fierce left-foot shot was no more than they deserved. "Not good enough for Liverpool. As it stands, they're going out." Liverpool need two goals in 45 minutes to keep the Champions League dream alive. So who is on the bench? No Fabio Borini. No Mario Balotelli. No Neil Mellor and no Florent Sinama-Pongolle. Unfortunately. Brendan Rodgers does have Philippe Coutinho, Adam Lallana, Emre Can and Lazar Markovic up his sleeves. Nathan Coleclough: It's not crisp, sharp or clinical. Glimmer of hope is the pace of Sterling. Ludo Bennett-Jones: We used to have Alonso and Mascherano marshalling midfield . Now it's Lucas and Allen. It's just depressing! Apparently this is the first time in Champions League history that two Welshmen have scored on the same day (Gareth Bale and Aaron Ramsey). Where were you Mark Pembridge and Barry Horne? Tom Wylie: Anfield quiet, Rodgers clueless and only 3 players are good enough! We can say goodbye to the Champions League now! Not good enough from Liverpool. Not good enough by a long, long way. First, Cristiano Ronaldo allowed Gareth Bale to take a free-kick 20 yards from goal, now the Welshman is getting in on big Ron's salmon-leap, bullet-header routine. He didn't have much marking to put him off his stride mind you. In off the bar from a near-post corner and Real Madrid are two to the good against Ludogorets. Almost goodnight and game over! Shklezen Gashi strokes into the net for a second Basel goal - but the hosts are rescued by a correct offside flag. Liverpool need half-time to regather and regroup. I like the look of Basel number seven Luca Zuffi, busy and bright, popping up in the hole and always in space too. He's looked infinitely more dangerous than anyone in a red shirt so far tonight. The rain lashes down onto Brendan Rodgers' face, adding insult to injury. "Frustrating with a capital F for Liverpool and if anyone is going to score another goal it's going to be Basel. "Liverpool are struggling to create any sort of an opening, they need to score twice remember." Jamie Miller: If we're honest, LFC don't deserve to go through from this group, sub-par performances and a lack of CL quality throughout. All over the place. Liverpool's defence is ragged as you like as they hack and dice away at a left-wing cross, Martin Skrtel eventually getting some part of his body in the right place to block a stinging low drive. A second Basel goal would have the Reds fans looking at Europa League draw details. It is still scoreless at the Juventus Stadium. If it remains that way until full-time the hosts will advance to the last 16 behind opponents Atletico Madrid. Olympiakos are keeping up the pressure on the Italian champions. They have taken the lead at home to Malmo through David Fuster with former Fulham man Pajtim Kasami getting an assist. Steven Gerrard pops a crossfield pass out to the right which Glen Johnson can't control. Gerrard lets rip with a mouthful of Scouse - that's just not good enough. Liverpool need to raise their game by at least 50% here. Basel look in total comfort. "There's only one team in this at the moment and Basel deserve their lead. "Liverpool are struggling to create chances." How Liverpool could do with an Aaron Ramsey style moment of inspiration now. As it is, their Swiss visitors are outstaying their welcome, popping the ball around with ease, feasting on the home side's sense of insecurity. And that could be 2-0! Captain Marco Streller doesn't know whether to head or volley at the back post and ends up shinning a good chance wide. Brendan Rodgers wears the look of a man who has just realised it's 5pm on Christmas Eve and he has yet to start his shopping. "Nerves were jangling here at Anfield even before Fabien Frei's goal. This has been edgy on the pitch and off, a situation not helped by the uncertainty of Liverpool's defence and the lack of assurance offered by keeper Simon Mignolet. "Plenty of time for Liverpool to still pull this around but they will have to show a lot more than they have up to now and frustration is mounting inside Anfield." Aaron Ramsey has just scored a goal good enough to win the Champions League outright. Give him a medal right now. Head to the match page here. Loz Smith: No speed for Liverpool in the passing, thinking, pressing or anything else. Need a Christmas miracle if we don't up the tempo. Fabian Frei has now scored at Anfield, Old Trafford and White Hart Lane. The scourge of Premier League sides. It was thoroughly deserved too, the Swiss side well on top for the last 10 minutes or so. What can the Reds do about this? Raheem Sterling hits a shot right at the keeper. This could be the start of a long night for Ludogorets. Marcelinho, stationed on the line, sticks out an arm to block Raphael Varane's goal-bound header. Although Gareth Bale thrashes home the loose ball, the referee has already blown up to pluck out the red card, point to the spot and give Cristiano Ronaldo a 12-yard set-piece. The Real kingpin trots up and clips the spot-kick down the middle. Real lead 1-0. "No surprise that the Swiss champions have taken the lead. "A super goal from Fabian Frei. He took it down well with a great left-foot shot. "They only need a point, they're on course for all three." It had been coming, you have to say! Basel lead and it's a lovely finish at the Kop end. Fabian Frei plays a give-and-go with dangerman Luca Zuffi before cracking in left-footed from 20 yards. Right into the corner. Twitter: Fire and brimstone from the crowd for Raheem Sterling as he plays a bad ball in the box. Not much patience here with this Liverpool side. Max Gay: I'm referencing a 2,500 word agenda-setting essay and the Liverpool fans moaning is more depressing, how about some support? A sign of low confidence? Raheem Sterling drives into space on the right, the shot is on but he tries to cut it back to Steven Gerrard and the ball is easily cut out. Shoot! Keep your eye on Shkelzen Gashi. He's leading the Liverpool defence a merry dance right now, peeling away from Martin Skrtel to take down a long ball nicely, but his second touch is a duffer and the ball runs away. Smell that? It's tension. "Not exactly a thunderous atmosphere inside Anfield as yet as Liverpool seek the win the need to reach the knockout phase - and this is because it has been a low-key start from Liverpool. The days of last season when teams were blown away in an early blur of pace and goals seem a long way off. "Already some early groans about the time it is taking goalkeeper Simon Mignolet to clear, which is a bit of a recurring theme here these days." Ryan Lloyd: Jose Enrique looks a complete shadow of himself. Very shaky. I can only imagine how bad Moreno must be looking in training. Gareth Whalley: Allen and Lucas currently playing like the chuckle brothers. Keep bumping into each other. To me, to you! Best chance of the night, and it falls for the visitors. Incisive play as Luca Zuffi threads a neat pass through into the run of Shkelzen Gashi, he's on the left of the penalty area and goes for the first-time drive - but leans back and slices high and wide. Should be testing the keeper from there! Twitter: Only ten minutes gone but Anfield an edgy rather than optimistic place just now. Another goal in Turkey though. Flying in. "Liverpool have at least improved on the weekend where they laboured against Sunderland and couldn't manage a shot on target until 27 minutes. "A bit more intensity so far." Much more like it from Dejan Lovren, the former Southampton man finding some presence to leap clear of two Basle attackers and head out a dangerous inswinging cross. He's looked out of his depth at times since joining the Reds, they need him to learn how to swim. Fast. Liverpool seeing 70% of the ball so far, plenty of probing and swift passing in midfield. Jordan Henderson is playing on the left of a midfield diamond at the moment. The Basel fans making themselves heard in a lively opening, both sides playing at a high tempo. Steven Gerrard, miracle man, is playing high up the pitch, looking to link up with Rickie Lambert. There has been a very early goal in Istanbul. Basel press, and press hard as they fly out of the blocks to get into Joe Allen's face, forcing the Welshman into an early error. The Anfield crowd roar with approval as Raheem Sterling beats a man and Steven Gerrard has an early shot, curling tamely into the arms of Tomas Vaclik. Pete Mistry: People are forgetting what Allen, Lucas and Henderson did to Spurs about a year ago. Absolutely destroyed them. Two former Swansea managers share a handshake. Will it be buzzing Brendan Rodgers or Smiling Paulo Sousa later on tonight? Tuned in for the Arsenal game? Head to this page here. The standard thunderous rendition of 'You'll Never Walk Alone' booms down from the Kop. If that doesn't rouse the Liverpool players, nothing will. Steven Gerrard lines up his men in the tunnel, 'some on let's go go!' is the shout from a team-mate further back. Liverpool boss Brendan Rodgers: "That night 10 years ago was a great night for the club and roll on 10 years and we hope for a similar outcome. "The players are ready for it. They've earned the right to be here, it is a new experience and we are going to enjoy it. We must ensure that we keep our temperament and patience. "If we don't score early on, it's a game of 90+ minutes." On newspaper reports of a reported brawl between QPR players after their Christmas party: "I was in a different bar obviously when all this happened. "The club have come out and said exactly what happened. Steven Caulker came out of a bar, slipped over and banged his head. "If you wanted a more accurate headline, it would've been: 'Man Falls Over', but I don't think that would've sold as many papers. "It was an afternoon Sunday lunch anyway, we've got too many older heads in our squad for a late-night out." Fate. Up against your will. Through the thick and thin? Twitter: All the best for tonight, Reds. Come on. YNWA. Our live page on Galatasaray v Arsenal is now up and running. For all the action from Turkey, head here. Take Luis Suarez out of any team, and they will struggle. But a win tonight and Liverpool will be in the top 16 sides in Europe, and back in business after Christmas. Can they manage it? Kick-off is 15 minutes away. "£117m was spent in the summer and the accusation has been so far this season that those players are squad players and not a replacement for Luis Suarez. "Lazar Markovic has failed to complete 90 minutes so far and I've seen Liverpool a lot this season, they've played 12 games at home and only won six. "When you think of their title-push from last season, it was their home form which really underpinned it and they haven't been able to replicate it." Kevin Logan: Will everyone still be slating the line up if Liverpool win tonight? Get behind the team! "Rarely has the name of Fabio Borini been the subject of such discussion at Anfield as it has here tonight - puzzlement among many fans that the Italian striker is not even on the bench, especially with Daniel Sturridge and Mario Balotelli injured. "Unless Borini has suddenly picked up a late injury himself, this counts as being seriously out of favour." No strikers on the bench for Liverpool, and Brendan Rodgers has made fewer substitutions than any other Champions League boss this season (11). Stephen Lovett: Worst back four? Are you nuts? Torben Piechnik anyone? Half an hour until kick-off then. Can Liverpool get the win they need tonight? Frank Lopez: just give the three points to Basel already and let's watch Top Gun. There at least the good guys win. Do you feel the need. The need. For speed Frank? Mark Pougatch on 5 live Sport. Reporters Conor McNamara and Ian Dennis are in Istanbul and Liverpool respectively. In the studio is QPR goalkeeper Rob Green while David Pleat is the summariser in Istanbul. Mo in Manchester: Why set up defensively in a must win game even though you can't defend? This team selection has to be the worst from the many there have been all season. Shaun in Scotland: Liverpool have over £70 million pounds worth of Brendan Rodgers signings on the bench for their biggest match of the season to date, tells its own story. Rodgers out! "Big responsibility lies with striker Rickie Lambert on a night when Liverpool have to score. With Mario Balotelli and Daniel Sturridge injured, the lifelong Liverpool fan will be hoping to make an indelible mark as they seek the win they need. "Also time for the likes of £20m defender Dejan Lovren to show the leadership qualities and assurance that were used as selling points when Liverpool handed over such an expensive fee to Southampton." Twitter: Swiss journalists surprised by way Basel seem to be lined up. More attacking then expected. Seems to be 3-5-2, not Sousa's recent 4-3-3. The Reds have won six out of their 11 games against Swiss opposition and they have never been defeated by a Swiss side at Anfield. (W3 D2). Manchester City's day of European destiny comes against Roma tomorrow night, and manager Manuel Pellegrini has just confirmed that star striker Sergio Aguero will miss 'four to six weeks' with his knee injury. Merry Christmas Sergio. And a happy New Year. As we reminisce about a particular European night at Anfield, another one crops up on Uefa's list of the best goals scored in the last 60 years. Not Steven Gerrard, or Michael Owen, or Kenny Dalglish, or John Toshack, or Kevin Keegan, or even Emile Heskey. But Peter Crouch has made the top 10. A brilliant bicycle kick against Galatasaray in 2006 makes the list. Plenty still to play for in Group C, where three into two just won't go. Bayer Leverkusen are already into the last 16, but the Germans will be unseated from top spot if they lose to Benfica. Monaco and Zenit St Petersburg are taking on each other with the victor going through. The draw would give the French side a pass into the knockout stages. The lights are already up and the cleaner is sweeping up around the toes of the Group D teams. Arsenal and Dortmund are already through, Anderlecht are assured of a Europa League spot with only the seeding for the next stage of this season's Champions League to scrap for. Josh Jordan: I'd take Steve Finnan in at right back any day of the week over Johnson on current form! "Il Biscotto". Nope not something to be served up alongside your cappuccino. It is the Italian term used to describe two teams playing out a mutually beneficial result. Tonight, Atletico Madrid need only to avoid a two-goal defeat away to Juventus to be assured of winning Group A. Juve, under pressure from Olympiakos, need a point to be sure of second place. Will Juventus go for broke or biscotto? Arsenal players take in their surroundings in Istanbul. It's safe to report that this Liverpool team selection has not gone down too well with the majority of fans on social media. Joe Allen, Jordan Henderson and Lucas in the same midfield? Twitter: Plenty of experience in Liverpool starting XI, but is there enough pace? George Bagguley: Rodgers making rod for his own back not picking sub striker. Why he hasn't put Borini on bench is beyond me! Can nick a goal. "Simple equation for Liverpool. Beat Basel and they progress in the Champions League - anything else and they are out. It is a wet and cold night at Anfield and all the early noise inside the stadium has come from the visiting Swiss fans but manager Brendan Rodgers will be hoping Liverpool's fans make it red hot for Basel at kick-off time." So Liverpool need a win to progress in the Champions League - again - and all eyes are on Steven Gerrard - again. Brendan Rodgers says the club shouldn't rely on their aging skipper to come up with the goods. But who can you rely on? If a game came down to one moment, a late chance, a penalty, a decisive tackle, and you could choose one player from past or present, who would you nominate? Was Bryan Robson the man you wanted at the crunch moment? Didier Drogba the delivery man for big games? Alan Shearer the man for the crucial spot-kick? Fire away with your suggestions - and reasons why.